It's the NHL playoffs and this is most certainly the most wonderful time of the year. Think of it. We get to sit back with a bunch of friends and watch the Canucks attempt to win their first Stanley Cup. Yah, laugh if you want; but I am a die-hard Nux fan and I need to believe. It will eventually happen right? Hopefully in my lifetime! Now here is the thing. The Canucks were scheduled to play game two against the Hawks; however, we had our own league game to play! For the love of... Fine, we'll play our game and hopefully catch the last period afterwards. Luck would have it, the rink we were playing in had a view of the big screen TV at the bar. So during the game, I would "watch" at every stoppage in play. That concerned my team greatly since I am the goalie. I really should be paying attention! We ended up losing 1-0. That didn't bother me really, I just wanted to get outta there! And that is where another problem arose. Where could we go that had the game on while grabbing a bite to eat. Not a big issue right? Well, try getting into a pub or bar when there was still a period to play. Not a chance. So we had to choose a non-traditional place to watch the game and get our eats too. 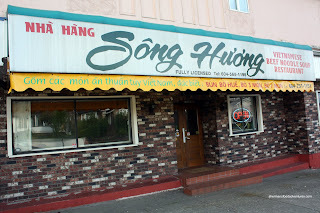 Enter Song Huong. Yes, that is right. Pho and hockey. A natural combination! Well, not really. 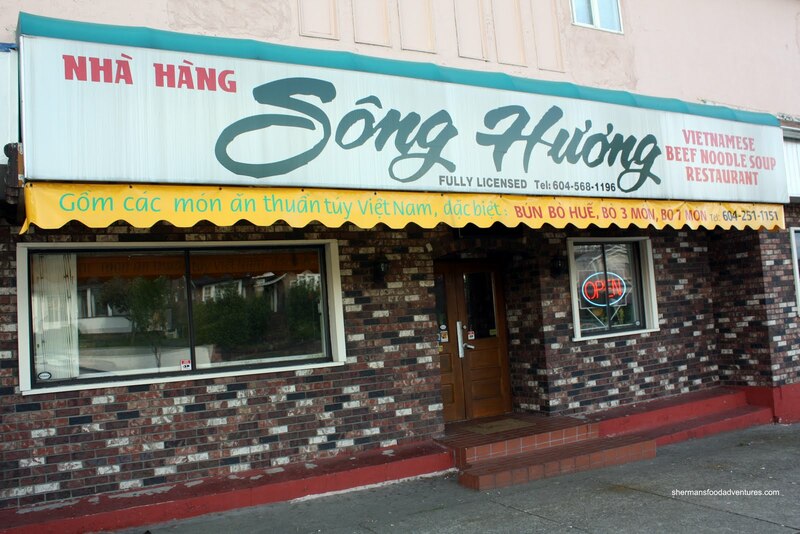 However, I remembered the last time I had the Bo 7 Mon at Song Huong, they had the hockey game on their big screen. We figured it wouldn't be a busy place and indeed it wasn't. Practically empty, we got our choice of seats. Naturally, we sat at a table with a perfect view of the TV. 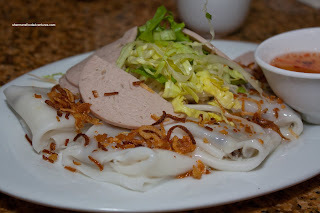 We got down to ordering and I started with a plate of the Bánh Cuốn. This is very similar to the Chinese rice noodle roll except for the filling. Traditionally, the bánh cuốn is filled with ground pork, wood ear mushrooms and spices. I found this version to be very good. The rice noodle had the perfect texture of being soft while maintaining its integrity and texture. 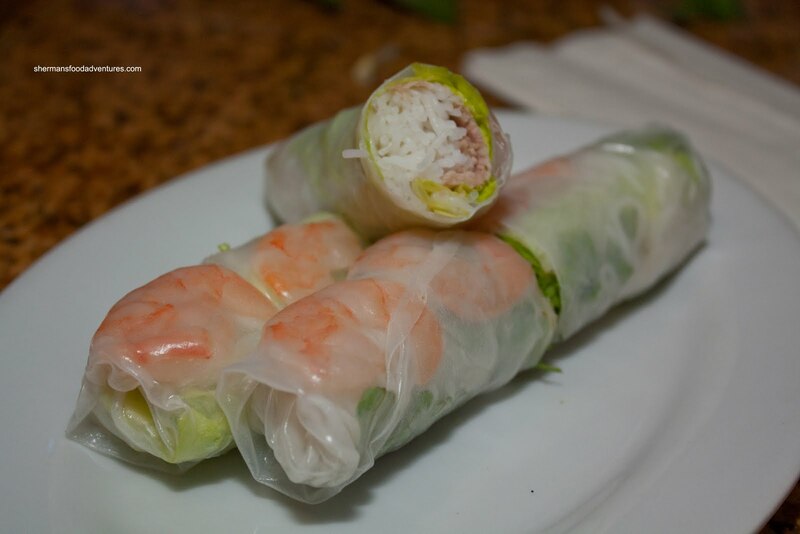 Dipped into nước chấm, this was a very pleasing dish while the Nux and Hawks were locked in a close game. Unlike last visit, I got to try other items other than the Bo 7 Mon (beef 7 ways). Since a few people were having the Pho already, I went for the Bún Bò Huế. 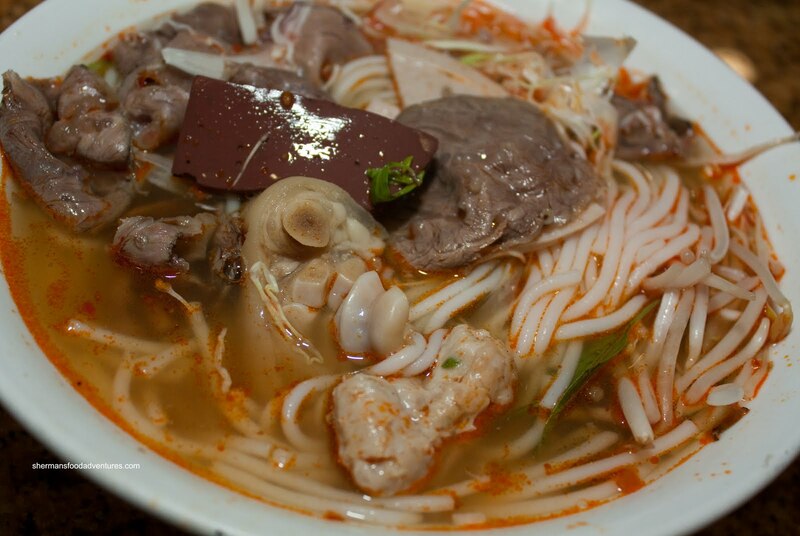 Unlike a traditional Pho, the broth in a Bún bò Huế is spicy with a few more aromatics such as lemongrass and chilis. Unfortunately, I found the broth here to be slightly underwhelming. 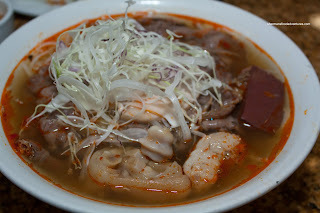 It tasted like they used the reg ular beef broth and added some chili oil. Nothing wrong with the broth itself, I actually drank all of it. However, it was not as flavourful as other versions of Bún bò Huế that I've had. I did like the plethora of meat on top, particularly the pork knuckle and pork blood. The sliced beef shank was a tad on the chewier side though. Gadget Girl, Silent Bob, Sweet Tooth and Emilicious all had a variation of Pho. So I only ended up taking a picture of the prettiest Pho, which was Gadget Girl's bowl. 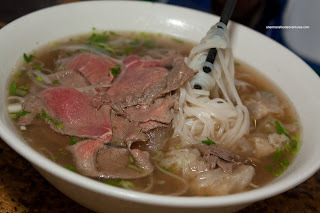 Looking like your typical bowl of Pho, there was a decent amount of meat in a darker -tinted broth. It may have been dark; yet it wasn't as "heavy" in flavour as it looked. That was not necessarily a bad thing since that could be overwhelming. As a group, everyone thought the broth was decent, if not pretty standard. Much like the beef shank in my bowl of noodles, some of the meats were not as tender as we would've liked. All-in-all, the pho can still be considered good. With everyone having Pho, I was afraid that was it for variety. Leave it up to Milhouse to save the day. 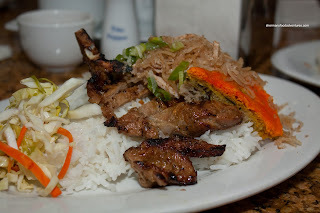 He went for a rice dish instead - the Lemongrass Chicken and P ork Cake on Rice. This was a pretty standard offering with nicely charred chicken and a tasty radioactive orange pork & egg patty. Gordo was not too hungry and went for a plain ol' Salad Roll. He ordered in fluent Vietnamese which totally surprised me. It was a good salad roll with everything proportionate and fresh. However, we weren't really paying much attention to the food since the game was on. We ended up winning which made us all happy. The food was decent as well, so we were a joyous bunch. With that being said, there are better places for Pho; but this place is more than acceptable.